Enjoy a culinary journey of refined and contemporary West Coast cuisine at the newly opened Leeto Restaurant by Chef Proprietor Garth Almazan. Authenticity and local specialities merge with sophistication in both the menu and restaurant design. Leeto (Khoi language: ’journey’) stays true to its unique beach location, capturing local flavours whilst at the same time boasting spectacular views. Chef Garth Almazan has opened his much anticipated restaurant in Paternoster. LEETO (the name is interpreted as ‘a culinary journey’) overlooks the beach and is located on the north eastern side of the village (driving into Paternoster, on the edge of the village on the extreme right hand side). Seating 60 diners, but up to 80 for weddings and private events, the restaurant presents refined and contemporary West Coast cuisine showcasing local culinary treasures including sustainable seafood and free range venison, as well as a selection of creative vegan and vegetarian dishes. 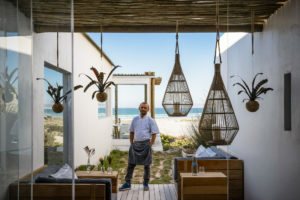 LEETO is a welcome addition to the growing ‘foodie-scene’ of Paternoster, and is one of very few restaurants here that are open seven days a week, right through the year – welcoming diners for both lunch and dinner. The restaurant design and decor is clean and modern with a ‘beachside sophistication’ that pays homage to its unique location. Designed to incorporate the natural elements of authentic Paternoster, LEETO is a tranquil, stylish and modern space in muted natural colours set as backdrop to the surrounding ocean, beach and fynbos. It comes with a fully stocked bar with excellent coffee and a good selection of local craft gins and beers, as well as a wine list that promotes wines from the West Coast region. Dining areas are located on the wind-protected wooden deck overlooking the beach, as well as indoors adjacent to a comfortable lounge with wood burning fireplaces for chilly evenings. Almazan and his wife Cecile operate LEETO as destination restaurant in partnership with Simone Jacke and Deon Brand. Seasoned hospitality experts and property developers in Paternoster and abroad, the Jacke/Brand couple are also the owners of the award-winning 5-star Strandloper Ocean Boutique Hotel, neighbouring the new restaurant. LEETO is proud to support and help upskill the Paternoster community with employment and in-house training of kitchen and waitron staff. For Almazan (43) LEETO is a dream come true as some of his earliest food memories include the delicious, spicy seafood family dinners prepared by his Philippine grandmother when he was a young boy. Born and bred in Cape Town, Almazan trained under Garth Stroebel at the Belmond Mount Nelson for three years before working as Head Chef at Shamwari for two years. This was followed by a record 18-year stint as Executive Chef at Catharina’s, the fine dining restaurant at Steenberg in Constantia, where he cooked to great acclaim and raked in several accolades over the years. He says: ‘It’s been a wonderful culinary journey for me from the Constantia winelands to the wild, natural beauty of the West Coast. Here in Paternoster we live close to nature and in harmony with the ocean. The natural environment has been a great source of inspiration and it has greatly influenced my food concept at LEETO. I’m excited to present fine, contemporary West Coast cuisine using local treasures from the sea, such as oysters and mussels, and sustainable fish including Cape bream, which one will not easily find on menus in the city. West Coast rock lobster is unfortunately on the red endangered list, and therefore we will not serve this local delicacy until its status is not under threat anymore. LEETO will focus on the specialities of the region, with fresh, seasonal and wherever possible, organic and sustainable produce presented in a compact menu of exciting and delicious, but accessible food that you can eat every day. For lunch and dinner, we offer a choice of about six starters and six mains and a variety of desserts, complemented by daily specials and depending on what is available fresh, and of top quality. I like to support our local producers, farming and fishing communities on a daily basis and promote the culinary highlights of the beautiful West Coast’, he concluded.